Hell, yeah, Tamba Hali can kick it. KANSAS CITY, Mo. 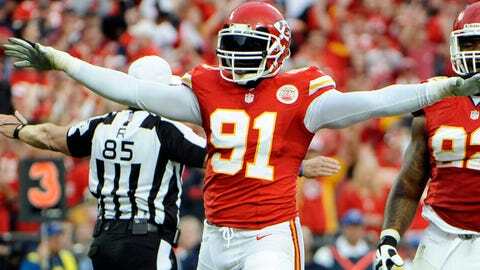 — Can Tamba Hali kick it? Three words: Oh, hell, yeah. The Kansas City Chiefs’ pass-rushing ace has made no secret of his passion for hip-hop — he owns a record label, Relumae Records, whose stable of artists includes Gillie Da Kid and Starzz. But Tamba can bring it, too, as evidenced by the single he released this month via the EchoingSoundzMuziK feed on SoundCloud: "HELL YEAH." The record "HELL YEAH" is all about the first class escape; champagne, private jets, and five star hotels. With a mix of R&B vocals and Hip-Hop bars you can easily find yourself cruising to this record as we usher into the summer. Hell Yeah!!! The 30-year-old outside linebacker opened up to AllHipHop.com in February about his love for music, an interview in which he described himself as a "lyricist, a backpack rapper." AllHipHop: In regards to football you’ve faced a lot of changes this season. How has the transition with new quarterback Alex Smith been? Tamba: Alex has definitely brought a new dynamic to our team. I think before, we were hoping to win with guys we really weren’t that confident in. And somewhere, Matt Cassel just shook his head and went, "Aw, hell, no." At any rate, the first phase of the Chiefs’ spring offseason workout program continues, with the first official OTA sessions slated for May 27-29. In the meantime, you can check out more of No. 91’s beats via his SoundCloud feed or through his record label. Hali’s beats include "Jodeci," a freestyle rap that references his college coach, the late Joe Paterno, as well as many, many, many more NSFW references.